Don Detwiler, chairman of New Enterprise Stone & Lime Co. Inc., was named the recipient of the 2018 Hartmann-Hirschman-Egan (HHE) Award, one of the American Concrete Pavement Association's (ACPA's) highest and most coveted awards. "Don Detwiler served and led the industry nationally and locally in Pennsylvania with class and vision. He led the way in getting our first chapter off the ground in the northeastern U.S. He also assisted the industry through challenging times as ACPA's chairman in 1979," Niederriter said, adding, "In that role, he led the change of our name from the American Concrete Paving Association to American Concrete PavementAssociation. The simple act of changing our association's name actually inspired a new vision and a renewed focus on our mission to support our members and chapters, something that is more important than ever today." Niederriter also recounted a few of Detwiler's many career highlights, beginning with his early years with New Enterprise Stone & Lime. "Don graduated from Juniata College in 1964 and joined the family business at a time when New Enterprise began paving concrete roadways," Niederriter said. "This was the start of 50-plus years of concrete paving excellence in building highways such as Interstate 80, Pennsylvania Turnpike, Route 22, Route 220 and the Bud Shuster Highway. 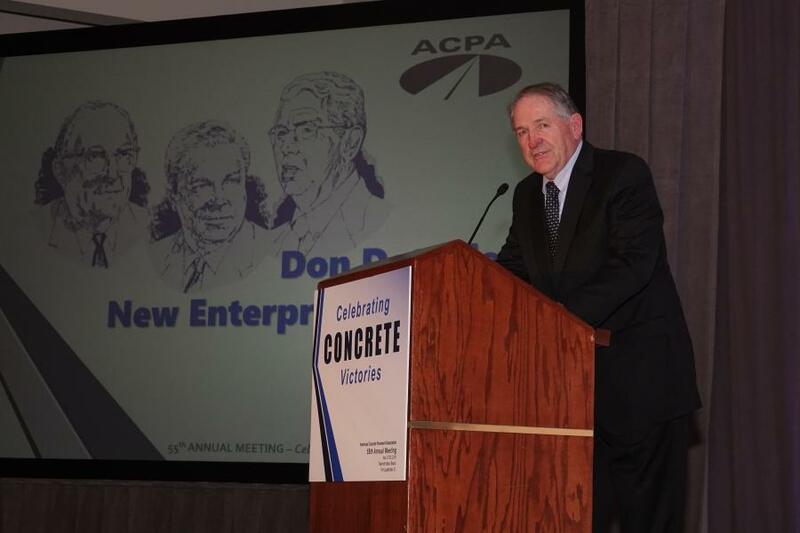 "Under his guidance, New Enterprise achieved the Mile-a-Day Club [recognition by ACPA] on a few occasions, paved over a million square yards in one season, and we estimate that Don was involved with over 14 million SY of concrete paving. I think it is safe to say that he has built more concrete roads in Pennsylvania than any other company," he added. Niederriter spoke about influence, and said, "[Don] has been very influential to both PennDot and the Pennsylvania Turnpike Commission, which led to many projects throughout the state of Pennsylvania. "Influence can occur in many different ways," Niederriter said, adding. "Don's influence is borne of his integrity and quality of work." The award is one of the most coveted awards presented by the American Concrete Pavement Association. The award recognizes individuals and companies, as well as other organizations, for unparalleled commitment, dedication, participation and leadership in the concrete pavement community. First presented in 1968, the award was originally named in honor of Harold W. Hartmann, who served as the association's secretary-treasurer from 1964 until 1974. In 1987, Robert E. Hirschman's name was added in recognition of his term as the association's chairman (then president) in 1967, as well as his tenure as secretary-treasurer from 1975 to 1987. In 2007, the name of Edward A. Egan was added in recognition of his steadfast leadership and dedication to the association and the industry it serves. Among the stations he occupied was the ACPA's chairman in 1986, as well as secretary-treasurer — from 1988 to 2007, making him the longest-serving person in that capacity in the association's history. These individuals demonstrated leadership and tireless dedication to the concrete pavement industry, which helped shape the ACPA and the industry it serves. The award is presented to individuals or groups that demonstrate the same level of dedication as Hartmann, Hirschman, and Egan.